Last Friday, November 8th, we lost our Golden Retriever, Lucy. She collapsed in our yard while running and playing and died instantly. She was a mere eight years old and was full of life until that last second. The vet speculated that the cause was cardiomyopathy – a weakening of the heart muscle. 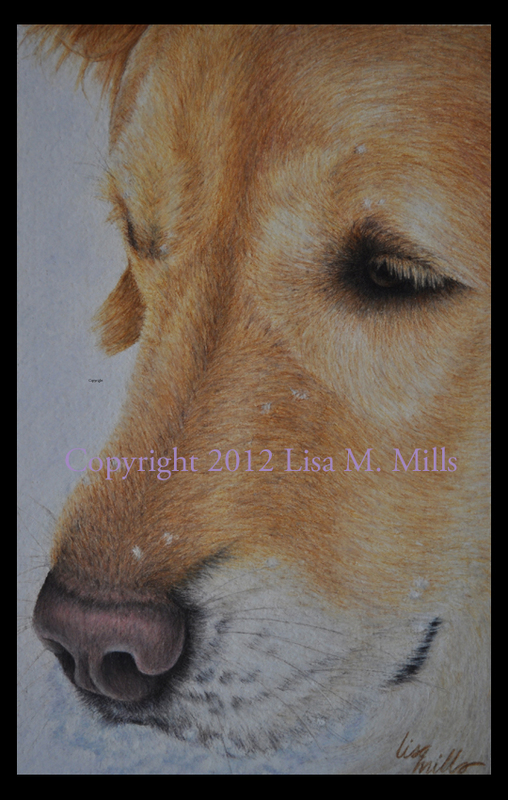 The photo you see here is of a colored pencil piece I did of her last year, her muzzle full of snow. It’s titled, Snowdog. She truly was the best dog we’ve ever known in my family and even though it’s been a week, the grief I’m suffering has not abated. Not one bit. I’ve never known a dog with more spirit and character and the house feels empty without her in it. Our poor other golden, Gracie is grieving right along with the rest of us, her leader and playmate nowhere to be found. Lucy loved her people. She liked to be nearby…I mean really nearby. She’d often times lean on me, or plop her head in my lap in order to get an ear scratched. If that didn’t do it, I was likely to get the paw slapped upon my knee until I paid attention. She knew how to get your attention. She had a little trick she’d do if you weren’t paying attention. We called it “the head toss.” If she wanted to go out, or wanted a bite of what we were eating, or simply needed you to pay attention to her, she would flip her head in the air – often twice in a row. Then she’d stare at you and command the stage. You became her audience and she was on the stage. She didn’t like loud noises and she hated it if I swore at the television when my favorite football team was playing poorly. If you called her over, most times she would go find a ball or another toy to bring to you – an offering. She knew how to make you smile and she loved to please her people. 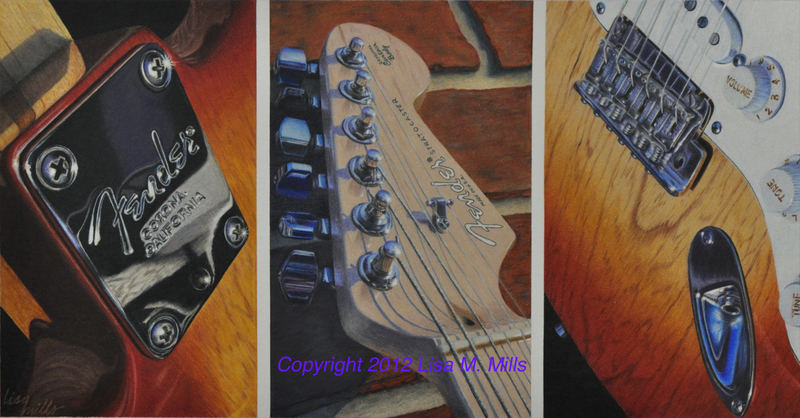 My artwork centers mainly around two things – the very realistic still life (such as my guitar and saxophone triptychs) and animal art. Many people shun animal art in favor of more trendy or contemporary art. I’ve met plenty of people like that and I don’t understand that mentality. They really criticize works that depict horses, dogs, or even the family cat. If that inspires the artist, then why not a painting of your favorite pet? I think animal art has just as much significance in the art world as a still life of two apples on a table – maybe more. For some reason, animal art is much more challenging to me to portray the animal realistically enough. Often, fur comes out somewhat stylistic, which is not my intent. My therapy in this time of grief is to do a portrait of Lucy. My photo reference is a favorite of mine, her playing in the snow again. I don’t love the lighting in it because it was taken on a cloudy day, but I love the expression on her face. I just hope I can do her justice and capture that expression. My favorite part of illustrating animals is working on the eyes. They really do capture the soul and if I can depict the expression properly, I can capture the animal’s personality. Hopefully, I can post some works in progress of her portrait. I’ll have to put the work aside for a bit to prepare for the upcoming holidays and get ready for a workshop I’m having in February, but I will endure and see this portrait through. I read something written by Peter King, the Sports Illustrated “Monday Morning Quarterback” writer who lost his Golden Retriever the day before we lost Lucy. He said, “The easiest way not to feel this grief is to never have a dog. And what an empty life that would be.” Rest in peace, Lucy. I hope you have finally caught that squirrel you so desperately tried to catch while you were with us for those brief eight years. 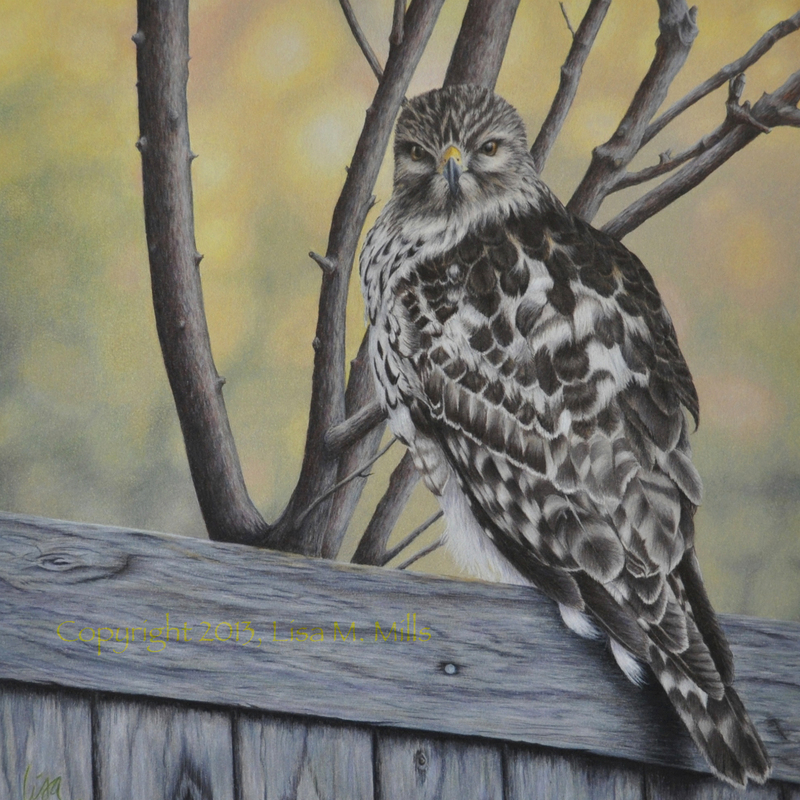 Just five days before the deadline, I’ve managed to enter two pieces into the Colored Pencil Society of America international exhibition. The first piece, Reflections on Cool Jazz was completed in late 2012. You can see a photo of it on my Gallery page. Morning Preyer was just finished yesterday after a big push to get the piece done in time for the March 31st deadline. I would not consider where I live “out in the country,” however, we’re fortunate to have lots of indigenous oak trees which provide great habitats to all sorts of species of birds. Morning Preyer is a Cooper’s hawk who nests each year in either our trees or our neighbor’s trees. This one was perched on our fence and seemed to have no problem with me and my camera as I clicked away. I loved the way the sun hit the leaves in the far background and chose to illustrate the background just as the camera saw it. This year, the hawks are not in our yard, but our yard is still part of their hunting ground. This one was intent on catching something to eat as he patiently waited on the fence. Our yard is home this year to a family of screech owls, who keep watch by day and hunt at night. Hopefully, they will provide some opportunities for photos as the owlets grow and leave the nest. Thanks to many of you who have “liked” my Facebook page. Many of you are fellow artists and it’s been a great way to get connected with you. The Facebook link is on the right column of this page…stop by and say “hi” if you like. Woo hoo! “Reflections on Heavy Metal” was juried in to the CPSA 20th Annual International Competition to be held in Covington, Kentucky this summer. I stumbled on this bit of news in an unexpected way. I was perusing through my Facebook newsfeed last weekend and stumbled upon a status update for another CPSA artist. She said in her update that a work she submitted was juried in to the CPSA show. While I was excited for her, my heart absolutely sank. I had received no communiqués from CPSA about the list of accepted entries. In fact, the list wasn’t due to be posted for another few days. With my heart racing, I immediately went to the CPSA website. I clicked on their “news” link and saw that the list of accepted entries was, in fact posted. One more click took me to the list. I thought about it for a moment, then begin to slowly scroll down the page. Since the list is in alphabetical order, it didn’t take too long to arrive at the “M’s.” Ma…Me…Mi…then I saw it! Mills, Lisa!!! Something resembling a squeak came out of my mouth. I couldn’t believe it. This is a huge honor for my name to appear amongst some really accomplished artists. So now, my framed work will travel to Covington, Kentucky this summer to appear in the exhibition at the Carnegie Center for about six weeks. Each accepted entry will be reviewed by the judge and from those, awards will be given to those who he deems has merit. Last year there were over 700 entries, with approximately 120 or so being juried in. From that, just over 10% will win an award. I don’t know where the judge thinks my work fits in this whole puzzle, but I am thrilled to have been selected to appear in the exhibition. On other notes of exciting news, I have teamed up with fellow artist and my former teacher, Alyona Nickelson in creating online tutorials as a part of her website. She offers subscribed members access to various tutorials and my first one has been published to the site! Also, this blog that you’re reading now is the Featured Artist Blog in Colored Pencil Magazine (both online and in print) for the month of May. Many thanks go out to Sally Ford, editor/publisher of Colored Pencil Magazine for deeming my work worthy of print! All that said, I must get back to work. Among the items I’m working on now is a larger piece of my two dogs playing in the snow and I have taken all the photos I need for an upcoming piece that will continue in my “Reflections” series. Not a guitar this time…but I’ll keep you guessing! Until then, here’s a picture of a work that I did of Lucy in the snow after I finished “Reflections on Heavy Metal.” It’s called Snowdog. Lucy, after her playtime in the snow came up for air with a “beard” of snow.